A horizontal wall seal was added to improve the low frequency horn's response accuracy. Enclosure material: Birch plywood and MDF. Product ID #: KHORNWPAIR. Product Information. Weight: 175 lbs.WARNING : California Residents - Proposition 65. Very Rare Un Common Special Order Veneered (Pau Ferro) aka Bolivian Rosewood. They still sound as good as they LOOK! Salesbaron is in Los Angeles, 90039. Due to age item is being sold AS IS. Floorstanding Speaker. 2" midrange and 1" tweeter compression drivers. We do, too. Each speaker features a small plaque identifying its numbered sequence in the series and is signed by the craftsman. All 70 th Anniversary speakers are housed in a book matched, limited edition Australian Walnut wood veneer. Packaging will be damaged, original box and accessories. Packaging may not be sealed. May have small minor chip and or dents. Open box Minor Chip & Dent... - Speakers Work Perfect You will receive: 1 Klipsch Klipschorn OPEN BOX MINOR CHIP AND DENT - Walnut (Pair). The circuit is similar to the type A as far as the midrangeand woofer is concerned, but adds tweeter protection to protect the K-77 tweeter. These tweeters have the larger, more powerful ceramic square magnets and have a higher frequency range than the previous round alnico magnet K 77 tweeter horns used prior to 1979. 1 Pair as shown in photos. 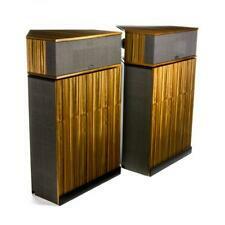 I’m selling my vintage pair of original Klipschorn speakers. I purchased these from the original owner in Dallas. They are sequential serial numbers, and the buyer will receive all of the original paperwork that came with these speakers in the 1970’s. They sound fantastic, and they have never been altered. The cabinets are in excellent condition & they are very heavy. I use McIntosh gear to power these, but a low powered amplifier will do just fine as they are extremely efficient. Please do your research & feel free to ask any questions. Here’s your chance to own a fantastic piece of history at less than half the price of a new pair. Local pick up only. I will not allow them to be moved until payment is made in full. Please feel free to ask any questions. I have not used them very often for I work out of state, they were recapped by Freeman Tuell and are ready for you. Black tower speakers RS-15 Black, RC-25 Black Center speaker, RS-25 Black rear speakers, RW-10 powered 120v Sub Woofer and Denon receiver 75 Watts. The badges are 3" in length. Condition is Used. Walnut finish in superb condition. Speakers are sequentially numbered. 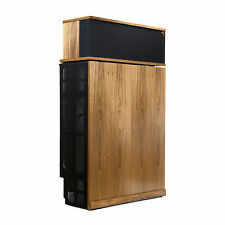 Vintage Klipsch Klipschorn K Horn Speakers Early Rare. Good Condition Considering They Ages. All Original and Sound As They Should. Local Pick Up Only. ??? Email or Text8183141658. The picture is of the actual item, Mint Condition! Very rare and hard to find! A piece of Audio History! These drivers were only produced for about a year during part of 1980 and 1981. Enthusiasts (including myself) have tested the dual phase plug version of the K55-V and the difference is quite audible compared to other versions.